Only 14 left! This item ships in 1-2 days. Riding a motorcycle is a passion for many and a dream for others. Present your favorite motorcycle enthusiast with this handsomely Engraved Motorcycle Pen Set. A thoughtful, personalized gift which looks great on your desk or in your briefcase. A Personalized Motorcycle Writing Set is an inexpensive personalized gift with an expensive feel. Each Rosewood Personalized Motorcycle Pen Set makes a unique gift for him or her. 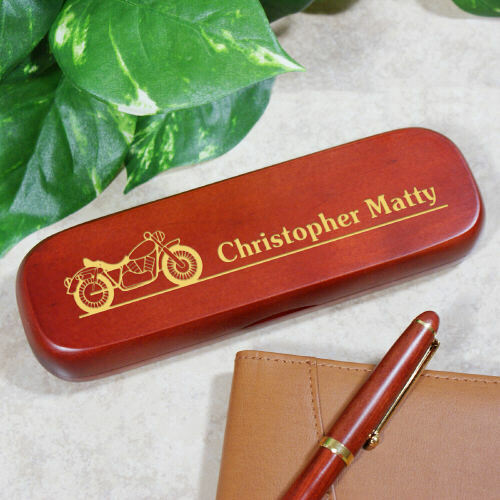 Additional Details Our Engraved Motorcycle Pen Set is a wonderful Personalized Gift for Him. We specialize in fine quality engraving which makes a great gift for birthdays, anniversaries, retirement parties and even graduations. Shop GiftsForYouNow.com for all your Engraved Gift Giving needs.